Some fishy is going on at the recently opened Nototel on Stevens Road. FiSK Seafoodbar & Market has set up shop, making it the dining and shopping heaven for seafood lovers. 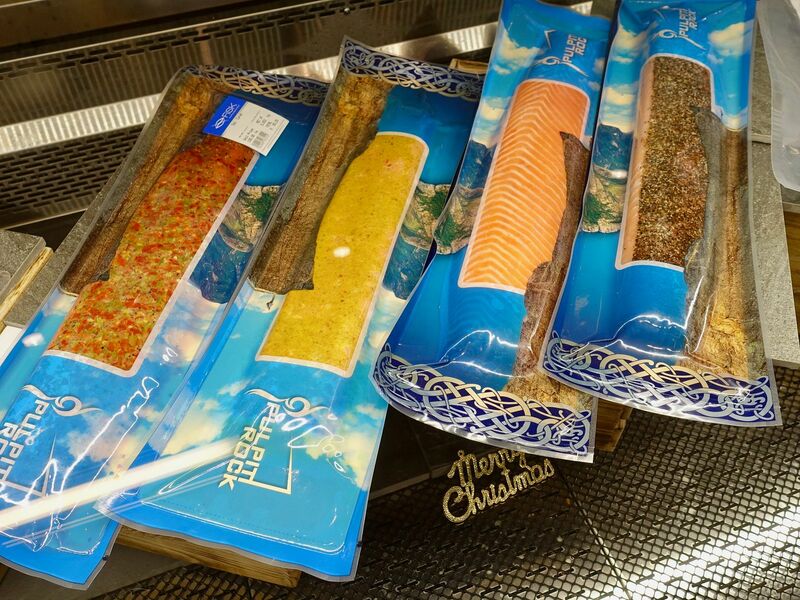 A wide variety of Norwegian and coldwater seafood is available. Fresh, sustainable, traceable, healthy, and safe, these are some qualities of the seafood brought in by Snorre Food, whose founder and CEO opened FiSK. Contrary to common beliefs that frozen food isn’t fresh, we learned that some fish retain their freshness, flavors, and nutritional benefits when gutted, cleaned, and immediately frozen until consumption. Well, the food at FiSK certainly changed our beliefs. 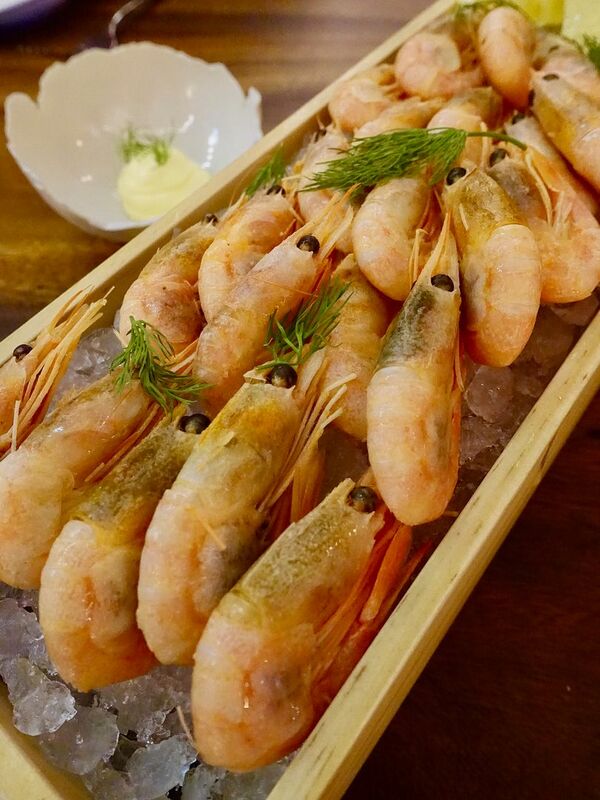 Prawns on Ice ($6/100g) are from the cold waters of Norway. 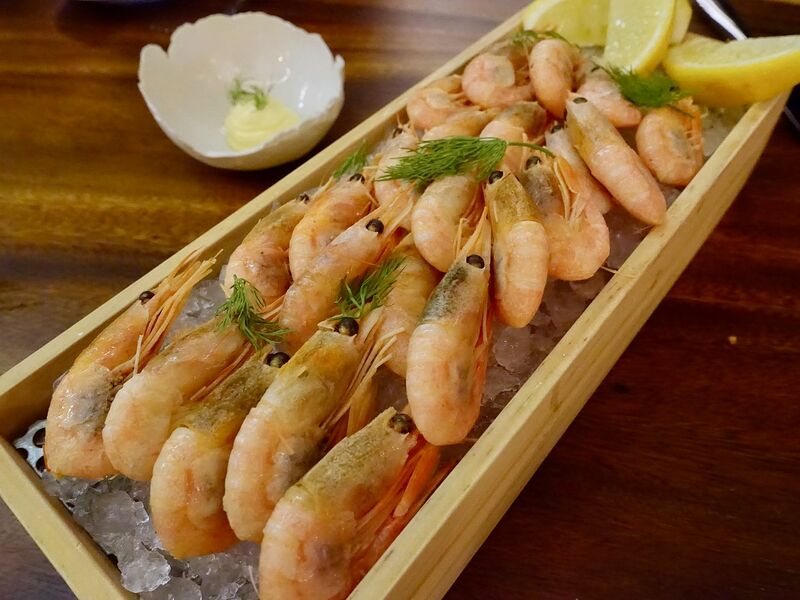 These little prawns are imported frozen for freshness and defrosted at room temperature before serving. Get yours hands dirty and you'd be rewarded with the sweet flavors of the sea. A surprise is hidden under the bellies of these little shrimps. Smoked Salmon "Pulpit Rock" (Lunch $10.50 Dinner $18) is a must at FISK. Fresh Norwegian salmon belly is cured with a salt and sugar brine before being smoked in-house! The result is slices of succulent fish that is flavorful without being overly salty. Together with the creamy scrambled eggs and housemade flatbread, we'd have this breakfast meal all day every day. Open-Face Smørrebrød Sandwich ($6/pc). The nutty rye bread is buttered with the lovely Røros Smøre organic Norwegian butter. Toppings vary daily and there are coldwater prawns, smoked mackerel, pickled herring, hard-boiled eggs, salmon tartar, trout roe, caviar, pickled onions and more. 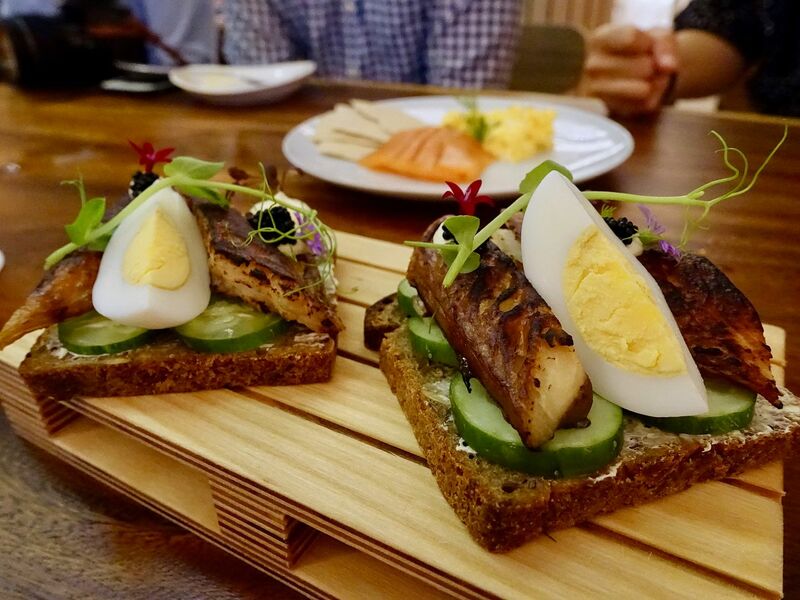 We had the House hot-smoked Norwegian mackerel with lumpfish roe, hard-boiled egg, sour cream, Japanese cucumbers, micro cress and edible flowers and it was delicious. I loved the smokiness in the fish which masked the typical strong fishy flavors of the mackerel. Hot mains for lunch include the Creamed Fish and Shellfish Soup ($7.50/$12.50). 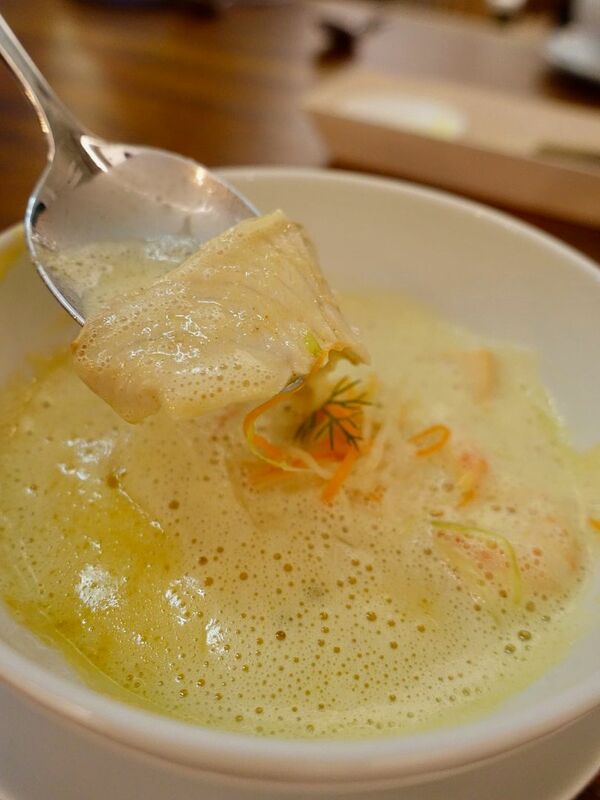 The creamy soup was full of depth due to the two base stocks that are used to make the broth. There's a white fish-bone stock and a shellfish stock from lobster and langoustine shells and tomato paste. Generous amount of fish meat (we had atlantic cod and Norwegian salmon), and coldwater prawns (which had the chewiness of lobster) fill the bowl along with julienned vegetables. This is the perfect comfort lunch i'd wanna have everyday. Dinner commences with bar bites and we had the Fried Herring ($3.50/pc) in sourdough batter. I was worried that it may be very starchy and fishy but instead the batter was very light and the dill and lemon gave the pickled Norwegian herring paste a refreshing twist. 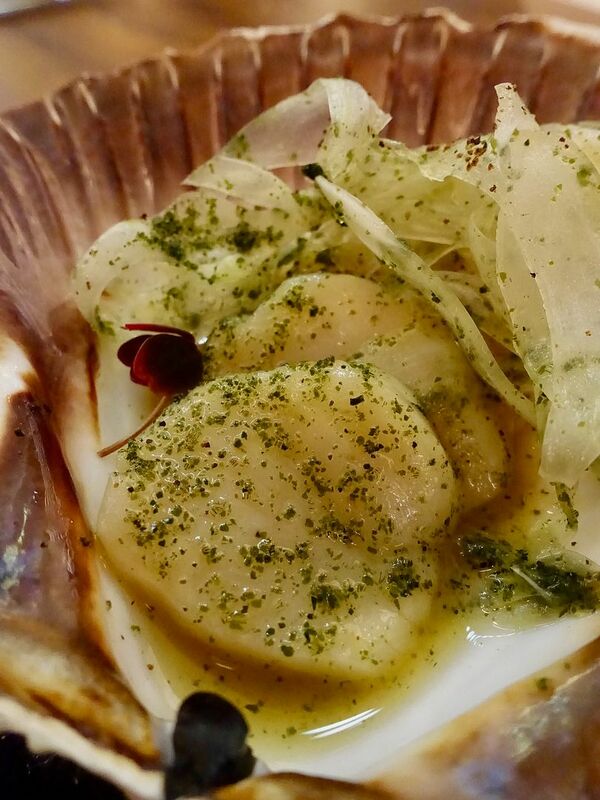 Raw Hand-dived Scallop ($29) is inspired by the owner's favorite Gin & Tonic with calamansi. Sliced plump Scottish/Norwegian scallops are dressed with a juniper and calamansi gastrique upon order and we loved that refreshing sour plum flavor to it. 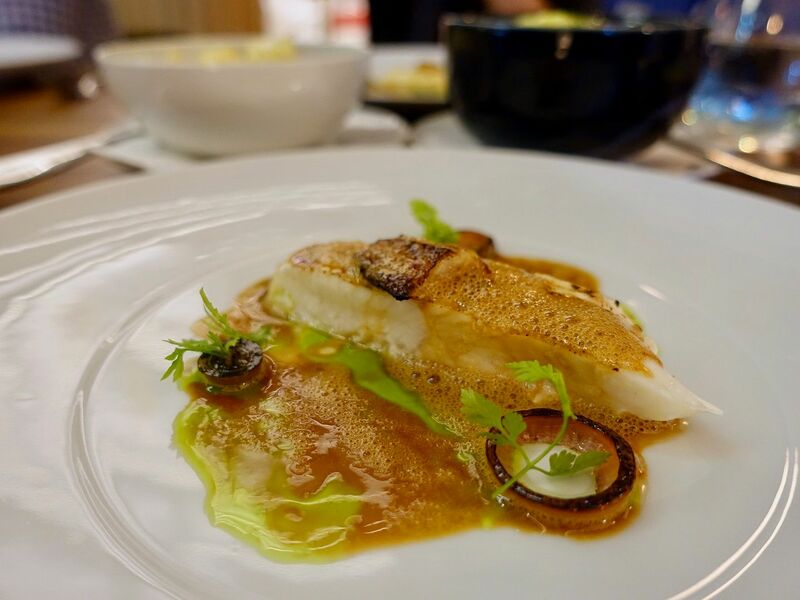 We had the Atlantic Halibut (part of dinner set menu priced at $88/pax) with foie gras red wine sauce. You'll detect the foie gras only if you are familiar with the flavor, as the liver is blended with red wine and beef bone stock. The delicate meat was brined, sous vide and then torched before service, giving it a buttery texture. 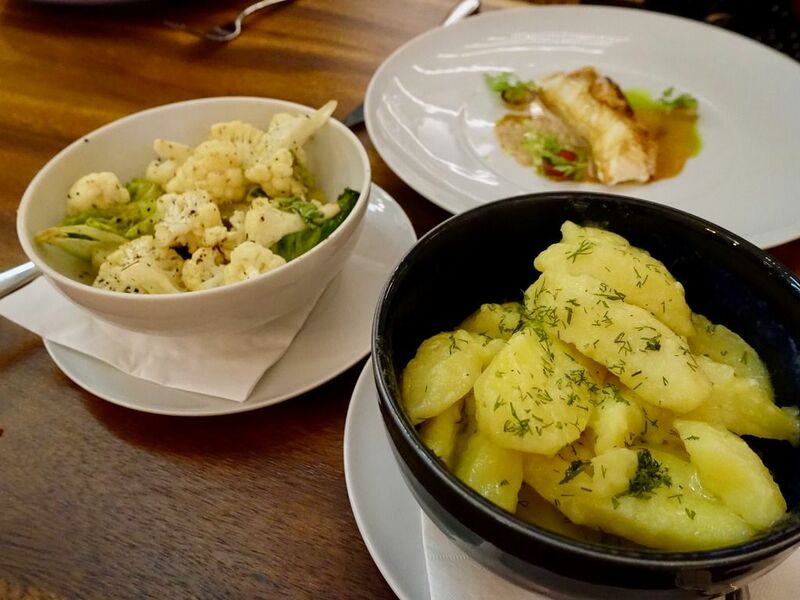 Other hot mains include Seared Langoustine tail with smoked bone marrow; Arctic Char; and sharing dishes like the Hot-Smoked Greenland Halibut. (min 2 pax). 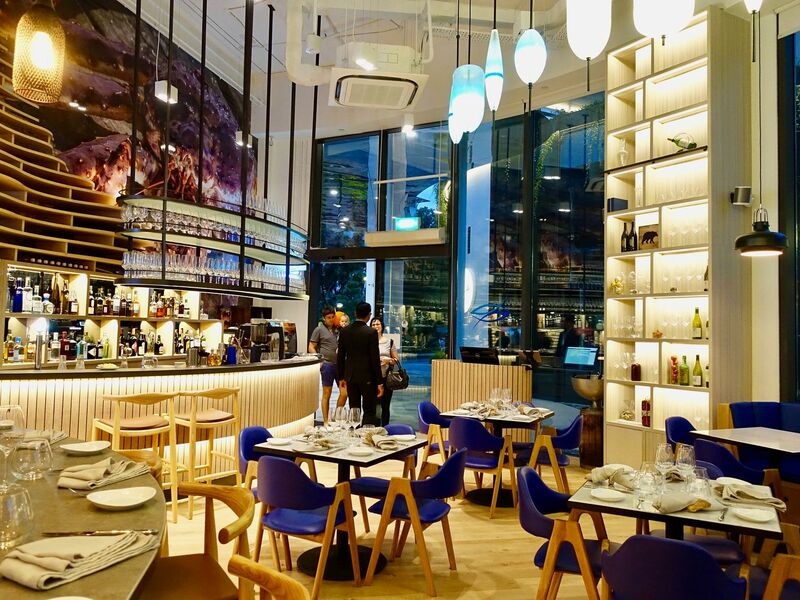 There's also the FISK’s “Plateau de Mer” (24-hour advanced order), a table-filled seafood feast of oysters, king crab, prawns, scallops, mussels and freshest catch from the counter. We found the desserts at FISK to be unique. 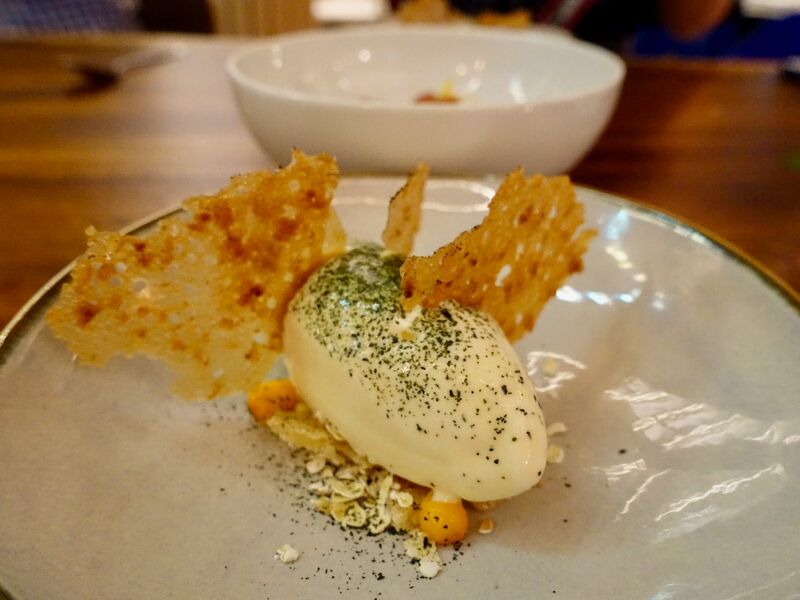 Check out the Uni Ice Cream ($16) which is made with neri uni (preserved salted sea urchin). The ice cream tasted a little more like salted egg yolk with a hint of ammonia. This is paired with rolled oats, Danish hawthorn berries and crumble. We also had the Sour Cream Mousse ($14) which was more of a firm pudding. Truth be told, you would hardly realize it’s sour cream. 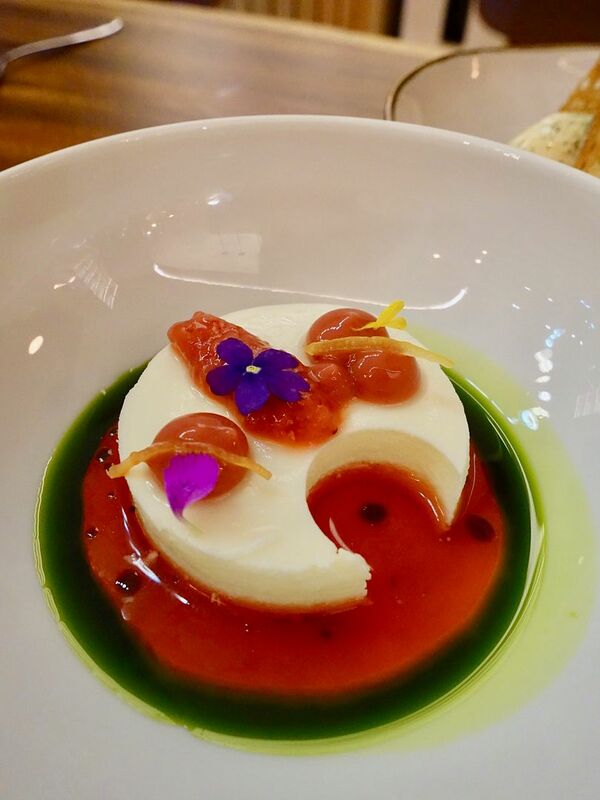 The use of basil helped to cut through any sweetness in this pudding (it wasn’t too sweet anyway). After enjoying a meal at the Seafoodbar, inspired diners can conveniently recreate a meal at home or purchase quality seafood, ready takeaways and Nordic products at the Market. The knowledgeable FiSK Seafoodbar & Market fishmongers would be glad to impart friendly advice on any aspect of cooking with their products. 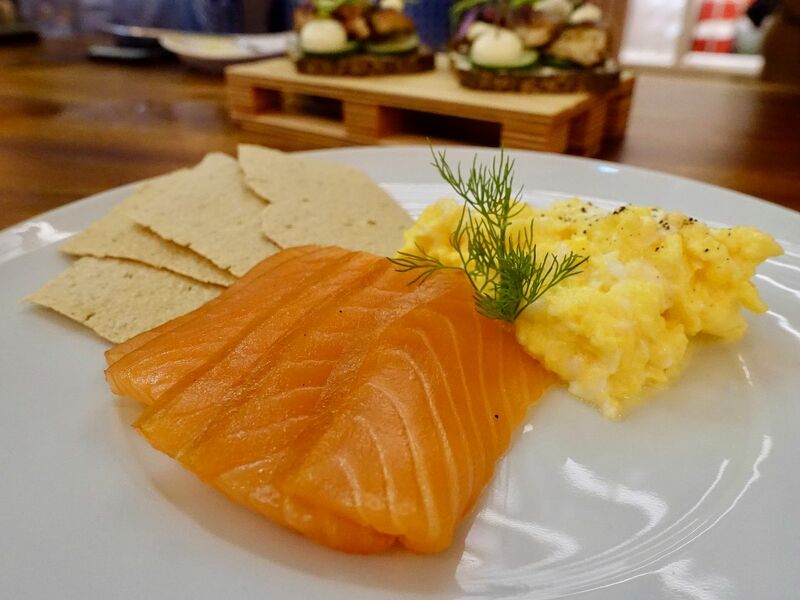 Highlights include the signature house-brand ‘Pulpit Rock’ – the first freshly smoked salmon range in Singapore with Asian flavours like Sichuan, black pepper, Thai curry and otah otah – as well as a wealth of Nordic foodstuffs such as house brand ‘Viking Water’ Belgian Blonde ale, complementary products to complete a meal, and Norwegian blue mussels exclusively imported by parent company, Snorre Food and retailed for the first time here. Expect Norwegian seafood like Skrei, red king crab, oysters and more. Time to go fishing for some delicious seafood over at FiSK.